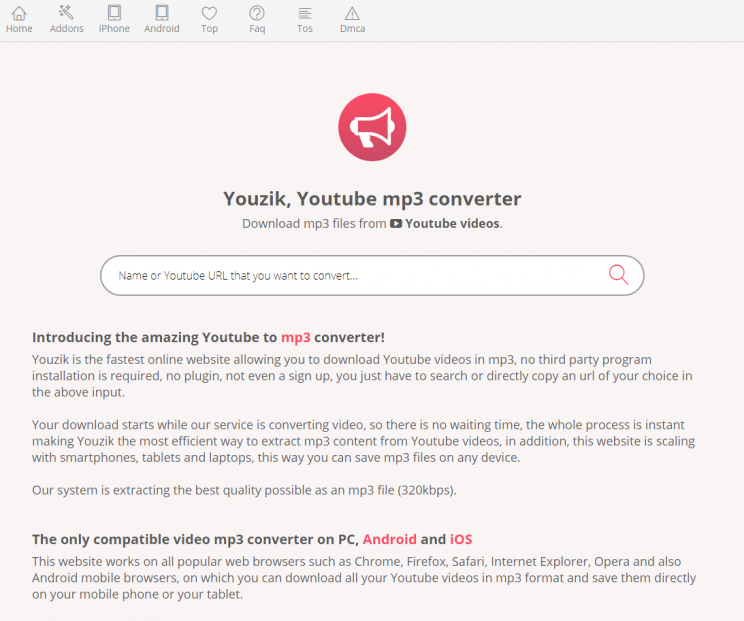 Today we’re going to look into this new youtube to mp3 converter i found youzik.com. and oh what a nice humorous domain name. imagine, it’s a combination of youtube and muzik (french, site is popular most in france). Good job on that!! And so we can see from the chart below, this is yet another site that’s greatly improved it’s rankings and gained lots of traffic after youtube-mp3.org takedown. On the other hand, quick conversion, rather fast download, and clean design. very nice. But let’s reserve the final judgement for conclusion section below, and now move on to the graphic tutorial. Today once more we turn our attention to Katy Perry’s Swish Swish youtube video. As was clearly visible in our previous attempt to download this video with convert2mp3 – this is not always possible due to copyright restrictions. But with youzik.com we can do it! Thanks to it being “not so big” yet..
We click download button, close the popup that shows right away, and continue to download the mp3. good job!! You can see my download in that screenshot below..
quick 1 minute video on how to use youzik.com to your advantage. enjoy!! nice website, but does popups, so minus 1 star. Then again, i tried to download a long 1.5hr youtube video of Maya Jane Coles liveset and all that youzik.com did was report about some local error and suggested to refresh the page. Cannot do it – tell me about it. For example, youtubemp3.today was fine with this long one. Took 2 minutes, but did it! And so was theyoump3, which actually did conversion on the fly and took the shortest time to start the download. ytmp3.cc also did good. But not youzik.com… so there’s another star gone… But otherwise it’s ok to use this website… Use your full discretion with the ads and popups, but otherwise it’s ok to use it.